Civil society organisations, international institutions and governments are becoming increasingly concerned about the appropriation and concentration of cultivable lands in numerous countries in the South and East by big businesses and corporations. This document is a synthesis of the available information on the situation, contributions from members of the Land Tenure and Development Technical Committee and research by members of an extended working group. It considers the meaning of ‘investment’ and the types of investment the world needs to achieve food security and protect the environment, distinguishes the privatisation of common resources from the concentration of lands that are already recognised as private property, and identifies new elements of land appropriation and concentration. to the play of the markets. Beyond the debate about different models of production, there are fundamental societal choices to be made. the need to recognise collective rights that ensure that private individual uses and rights are compatible with the general interest. These are explored at the national, regional and global levels. develop policies and mechanisms that reward labour and economic efficiency, and use land taxes to redistribute ground rents that it has not been possible to eliminate. The Comité technique «Foncier et développement» is an informal think tank composed of experts, researchers and officials from the French Cooperation. It was set up in 1996 to provide strategic support to the French Cooperation and supervise land tenure initiatives through a network of French and international actors. Initiatives by the Committee include the White Paper on land governance and security of tenure in developing countries - «livre blanc» produced by actors in the French Cooperation, and numerous other works and tools aimed at improving our understanding of land issues in developing countries and our ability to meet the challenges they present. 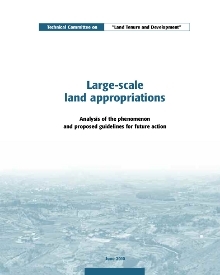 At the request of this committee and thanks to an Agence Française de Développement financing, AGTER has facilitated the reflexions of a working group on large scale land appropriations. This one gathered the ‘Land tenure and development’ technical committee’s members and numerous experts from various institutions and civil society. They met regularly during the last months to confront their views and analysis. The synthesis of their contributions has been drawn up by Michel Merlet and Mathieu Perdriault. Its French, English and Spanish and Portuguese versions are now publicised through the ‘Analysis and propositions’ document presented on the « site Foncier & Développement » or below. This document considers the meaning of ‘investment’ and the types of investment the world needs to achieve food security and protect the environment, distinguishes the privatisation of common resources from the concentration of lands that are already recognised as private property, and identifies new elements of land appropriation and concentration. We are all affected by this phenomenon, which is now a major global issue. Employment, the creation and distribution of added value, and the production of food goods and environmental services all serve the general interest. Their regulation cannot be left to the play of the markets. Beyond the debate about different models of production, there are fundamental societal choices to be made. Moreover, this report provided the basis for the positions of the French diplomacy on agricultural investments and massive land appropriation.